Competing proposals by the House and Senate would change how tax revenue from legalized marijuana is spent. The Senate would have the bulk go to education; the House would have it spent mostly on programs the voter-passed initiative had in mind. The initiative approved by voters to legalize recreational marijuana included a specific shopping list for spending the tax revenue, but the state Legislature looks poised to tweak those instructions, or even lose them entirely. To the dismay of public-health officials, that could mean cutting millions in prevention and treatment funds intended to offset the costs to society of legalizing pot. Complicating matters: No one really knows how much marijuana money the Legislature has to work with because both the House and Senate plan substantial changes to the pot law, such as regulating medical marijuana. Right now, marijuana is taxed at 25 percent for each rung in the supply chain. Most of the revenue was intended to fund substance-abuse prevention and treatment programs and health care, and to study marijuana’s effect on society. 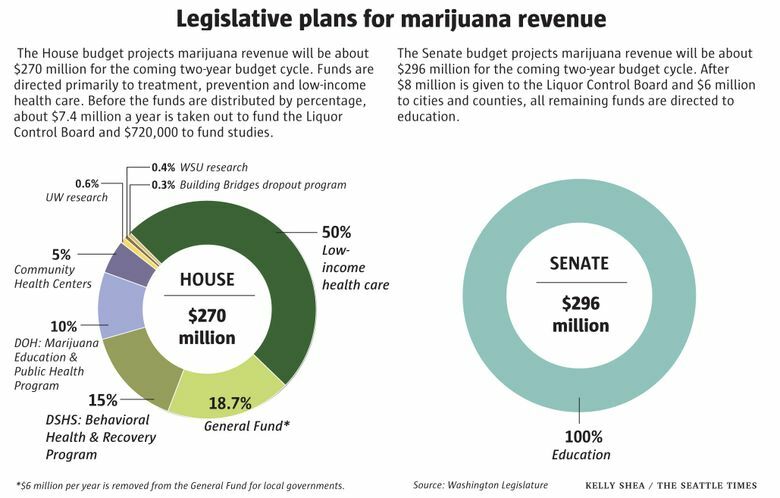 In February, the Washington State Economic and Revenue Forecast Council forecast the pot industry would bring in $221 million during the next two-year budget term, though the House and Senate budget proposals expect more. Republicans want to use marijuana revenue to avoid raising taxes while paying for education. Democrats seek to funnel more money into social services and low-income health care. Two years after voters approve an initiative, the Legislature can alter it with a simple majority vote. The Republican-led Senate estimates the marijuana industry will generate about $296 million in the next two years. Save for $8 million a year for the Liquor Control Board and $6 million a year split among cities and counties, that money will go toward education funding, a priority for the Legislature after the state Supreme Court ruled the state was legally obligated to increase funding to public schools. The Senate budget assumes that medical marijuana becomes part of the state system. It would condense marijuana taxes to a single tax of 37 percent, paid by the consumer when pot is sold. Rejiggering the tax structure should help marijuana businesses, because it would allow them to avoid some federal taxes. But public-health officials are concerned about the Senate’s budget plan. Dr. Gary Goldbaum, the director of Public Health for Snohomish County, did not support the initiative to legalize marijuana because he was concerned there wouldn’t be a focus on prevention and substance-abuse treatment. ACLU lawyer Alison Holcomb, who sponsored Initiative 502, said the Senate plan would make it easier to produce and sell marijuana while also “gutting the balancing features of Initiative 502” like prevention. Rep. Reuven Carlyle, D-Seattle, accused the Republicans of “sweeping away the spirit of the initiative” by seeking to use the revenue to fund education. Sen. Andy Hill, the GOP’s chief budget writer, balked at that characterization. “We’re upfront, we’re transparent,” the Redmond Republican said of the plan, noting the Senate increases mental-health spending, which he believes goes hand in hand with substance abuse. The Democrat-led House budget expects about $270 million in marijuana revenue. About $7.4 million a year would go to the Liquor Control Board, $720,000 to fund studies and $6 million a year for cities and counties. The rest is distributed, by percentage, to a number of prevention, treatment and health-care programs. As in the Senate, the House plan would condense marijuana taxes into one, but at a lower rate of 30 percent. Although that plan closely follows the initiative’s outline for spending, Hill noted the Democrats redirect funds, too. The House budget expands how agencies can use the money. For example, the Department of Social and Health Services would get funding for pregnant and parenting women’s services and life-skills training for youth. The Department of Health would be able to use pot revenue to help fund the Washington Poison Center. The revenue also would supplant other budget considerations, like funding for community health centers. Carlyle said the House budget still gives voters what they approved in I-502. Complicating matters further, legislators know they face a moving target. Because the recreational-marijuana market has only been running for about nine months, forecasters don’t have much historical data to work with. Just 137 stores of the 334 allowed under Liquor Control Board rules have opened. Local moratoriums can affect predictions. Plus, the Legislature must consider how substantial changes to the law, such as the regulation of medical marijuana, would affect future revenue projections. Rep. Cary Condotta, R-East Wenatchee, said he thought the Senate’s projection of $296 million was “a little enthusiastic” compared with the House’s estimate. Condotta believes lowering the tax rate on marijuana will sell more pot, and ultimately bring in more revenue. So far, revenue has outpaced projections. In November, forecasters predicted the state would make about $10 million on the cannabis excise tax for the fourth quarter of 2014. The state actually made nearly $12 million, according to a follow-up report in February. Hill said the forecasters have been very conservative. “If you look at receipts coming in this fiscal year, (marijuana tax revenues) are ahead of schedule,” he said. The House and Senate will negotiate a compromise budget in the coming weeks. Unclear of size, marijuana revenue might be one of the trickier pieces to fit. Information in this article, originally published April 9, 2015, was corrected April 10, 2015. Due to an editing error, a previous version of this story incorrectly stated that a two-thirds majority was needed to alter an initiative. A simple majority is all that is required.